LANSING, MI–The men’s cross country team traveled to state’s capitol to take part in the Lansing Invitational on Saturday. The meet, hosted by Lansing Community College, was held at Grand Park. Coach Shaw and the Mustangs were gearing up for a successful day after a great week of practice. The best part? They didn’t know how successful the end result would be. Both Mustangs who competed in the race set personal records. Anthony Butler, a freshman from Wyandotte Roosevelt, set his PR by finishing the 8K race with a time of 29:13 (84th place). 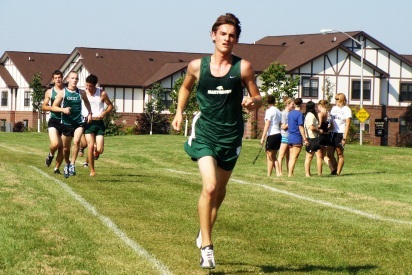 Franklin Murdock, a senior who also plays basketball for the Mustangs, finished immediately behind Butler at a 29:35 clip. Murdock’s time would be good for 97th place. The Mustangs now shift their attention to the Michigan Collegiate Invitational this Friday. The duo will look to make a splash after after setting personal records this past weekend. All the action is set to take place Friday at Calvin College in Grand Rapids.